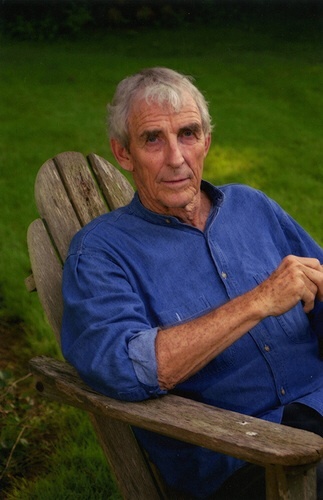 We have received word that Peter Matthiessen, a founding editor of The Paris Review, died today after a long battle with leukemia. A Zen priest, novelist, environmentalist, and two-time winner of the National Book Award, Peter was a heroic figure to generations of readers, including our own. He lived a life of adventure but was, even in public, the first to admit his vulnerabilities and flaws. As a writer, he held himself to the highest standards—his own—even in the face of incomprehension or disregard. As the most senior member of our board, and one of the last living founders of the Review, he was unfailing in his encouragement and love of this magazine; we have lost a progenitor, a guiding spirit, and a cherished friend. You are one of the few writers ever nominated for the National Book Award in both fiction and nonfiction. Define yourself. I am a writer. A fiction writer who also writes nonfiction on behalf of social and environmental causes or journals about expeditions to wild places. I have written more books of nonfiction because my fiction is an exploratory process—not laborious, merely long and slow and getting slower. In reverse order, Far Tortuga took eight years, At Play in the Fields of the Lord perhaps four, and the early novels no doubt longer than they deserved. Anyway, I have been a fiction writer from the start. For many years I wrote nothing but fiction. My first published story appeared in The Atlantic the year I graduated from college and won the Atlantic firsts prize that year; and on the wings of a second story sale to the same magazine, I acquired a noted literary agent, Bernice Baumgarten, wife of James Gould Cozzens, the author of a best-selling blockbuster called By Love Possessed, whose considerable repute went to the grave with him. And when did you start your first novel? Almost at once. It was situated on an island off the New England coast. I had scarcely begun when I realized that what I had here at the very least was the Great American Novel. I sent off the first 150 pages to Bernice and hung around the post office for the next two weeks. At last an answer came. It read as follows: “Dear Peter, James Fenimore Cooper wrote this 150 years ago, only he wrote it better, Yours, Bernice.” On a later occasion, when as a courtesy I sent her the commission on a short story sold in England, she responded unforgettably: “Dear Peter, I’m awfully glad you were able to get rid of this story in Europe, as I don’t think we’d have had much luck with it here. Yours, Bernice.” Both these communications, quoted in their entirety, are burned into my brain forever—doubtless a salutary experience for a brash young writer. I never heard an encouraging word until the day Bernice retired, when she called me in and barked like a Zen master, “I’ve been tough on you because you’re very, very good.” I wanted to sink down and embrace her knees. Read Matthiessen’s Art of Fiction interview and his story “A Replacement,” and listen to him on the art of travel writing.